I was hoping to send you the second issue of FOOTNOTES in 2006 earlier. You will now be compensated for waiting with Greg Grooms’ proposal “In Defense of Certainty.” Greg and his wife Mary Jane direct the former Probe Ministry in Austin, TX. Located very close to the University of Texas their house is constantly used for lectures, discussions, Bible studies, Graduate Fellowship gatherings and more personal assistance. Greg expresses here a common concern born out of his work and life there. Certainty is on the rocks, and Charles Krauthammer is unhappy about it. Need I point out the obvious here? That "very deeply held views" is, of course, a euphemism for religious beliefs, and Mr. Pryor not coincidentally is a devout Roman Catholic. At first glance this seems nothing more than more fallout from the last election: Catholics and Evangelicals are taking over America and we must put a stop to it! But lest Senator Schumer seem anti-Catholic or, God forbid, anti-religious, he was quick to add a disclaimer: he's suspicious of anyone with deeply held views. It seems his dismay at Mr. Pryor's nomination sprang not from bias against Christians, but from fear of those who are certain. Mr. Krauthammer's purpose in telling his tale and mine in recounting it here isn't to score political points, but rather to make a point about our culture: ours is a culture of doubt. In his words, "The new wave is fashionable doubt. Doubt is in. Certainty is out." You probably don't need to be convinced of this. Most Americans feel about doubt the same way Texans feel about a hot summer: it is an inescapable, if not entirely pleasant fact of life. At times we may make jokes about it (In his Devil's Dictionary the19th century satirist Ambrose Bierce defined certainty as "being wrong at the top of one's voice. "); at others, we like Mr. Krauthammer may decry its power. But we never, never consider certainty as a serious alternative. Even the evangelical Christians that so badly frighten the political left in the US are loath to claim certainty. Consider this excerpt from a book published by a prominent evangelical publishing house, and written by a professor at a Christian college: "My own experience is that for humans certainty does not exist, has never existed, will not---in our finite states---ever exist, and, moreover, should not.” The title of the book? The Myth of Certainty. What may be harder for the post-modern generation to swallow is the idea that things haven't always been this way, that there once was a time in which certainty was thought possible and those who possessed it were esteemed. In the small town Alabama of my childhood strong convictions were seen as a sign of character, and the lack thereof as a sign of untrustworthiness. Ours was the world as seen by Yeats. The unmistakable sign of the collapse of the center, of the triumph of anarchy, and the drowning of innocence? "The best lack all conviction..." Now it seems the tide has turned, now it is the certain who are lacking in honesty, curiosity, objectivity, and intellectual integrity. The road from Yeats to Schumer, from certainty to doubt is too rocky, too long, and too well-traveled for me to retrace it here, but please bear with me while I touch on a few high points along the way. In the minds of many the problem of certainty is at heart a problem of knowledge. We simply cannot know enough to be certain about anything. We are the intellectual heirs of René Descartes, who in his Meditations resolved "... that I ought no less carefully to withhold my assent from matters which are not entirely certain and indubitable than from those which appear to me manifestly to be false..." Simply put Descartes felt he had only two options: absolute certainty or pervasive doubt. To be fair to him I must admit that he made his resolution in the confidence that he would be able to find an sure foundation for certainty, and that in his opinion, he succeeded in doing so. In the minds of most of those who followed him, however, including me, he did not. It's ironic that the most enduring legacy of his over zealous quest for certainty is his commitment to doubt. Like Descartes, modern man feels that he should not be certain of anything that might possibly be doubted. And if our choices are only absolute certainty or anything goes, then the latter always wins in the mind of anyone except God. Thankfully, true knowledge presents us with more options than Descartes was willing to consider. Arrayed between the false dichotomy of complete knowledge and epistemological nihilism is a whole host of ideas, some of which warrant belief more than others. These range from the laughable--e.g., reality isn't real--, to the near-undeniable--e.g., a creator exists and there is a difference between right and wrong. (Jay Budziszewski, friend and professor at the University of Texas, entitled his book on ethics What We Can't Not Know.) Still others--e.g., miracles like the resurrection of Christ-- though inherently implausible, have within the right philosophical framework and with the sufficient historical evidence convincing power. In practice gaining knowledge simply isn't as hard as philosophy has made it these past few centuries. "But time ran out and the old modern world ended and the old monster theory no longer works. Man knows he is something more than an organism in an environment, because for one thing he acts like anything but an organism in an environment. Yet he no longer has the means of understanding the traditional Judeo-Christian teaching that the "something more" is a soul somehow locked in the organism like a ghost in a machine. Who is he then? He has not the faintest idea. Entered as he is inito a new age, he is like a child, who sees everything in his new world, names everything, knows everything except himself." To Percy our crisis of certainty is at heart a crisis of self-knowledge. The modern world rejected the framework that makes true self-knowledge possible--we are humans beings, made in the image of God, living in an orderly world that He has made--and as a result all other knowledge is called into question. We have become like children, who possess lots of information, but who lack the understanding and confidence to put it to work. Percy makes a good point, I think, given my generation's fascination with "Who in the heck are we?" questions. And even though the current generation of students with whom I share my life daily is less fascinated with these questions, it is no better at answering them than we were. C.S. Lewis captured this absurdity well in the finale of his Chronicles of Narnia, The Last Battle. Near the conclusion of the story Aslan, his Christ-figure, rescues from their imprisonment in a stable some children, the king of Narnia and a group of dwarfs. But though they stand on the green grass in the full light of day, the dwarfs persist in believing that they are still imprisoned in the stable. When Aslan growls, the dwarfs dismiss it as mechanical trickery. When he miraculously produces a glorious feast for them, they eat it, but tell themselves that they are only eating and drinking the kinds of things they might find in a stable: hay, turnips, cabbage, dirty water. In the end their suspicions of one another result in a feast-ending food-fight, and, oddly, words of self-congratulation: "Well, at any rate, there's no Humbug here. We haven't let anyone take us in." But Aslan has the last word: "They have chosen cunning instead of belief. Their prison is only in their own minds, yet they are in that prison; and so afraid of being taken in that they cannot be taken out." Like Lewis' dwarfs, the post-modern generation cherishes its doubt hoping it will protect them from the disappointment of believing Humbug, only to fall prey to any nonsense that comes along and to surrender any hope of dealing with reality. More plausible to me is the idea that doubt itself is a social construct. It works like this. I'm friends with Kalyan, an Indian graduate student in engineering at the University of Texas at Austin, whom I met while teaching a series on world religions a few years ago. He is bright, articulate, interested in many of the same things I'm interested in, and I enjoy his company. He is also Hindu and the head of the Hindu Cultural Society at UT a fact which creates a practical tension for me: how can someone who is so winsome be so wrong? Post-modernism offers me a tempting and socially acceptable resolution to this tension: deciding that all our beliefs are only cultural artifacts and therefore of little significance in our relationship. Of course there is a price to be paid for this relief: the thing that brought us together in the beginning---a serious discussion of ideas and their consequences--is now off limits to us and to everyone else. It's a price even the Christian students I work with are often too willing to pay. A series of discussion with these students on this subject last spring moved me to write this essay. The side of the discussion I've reviewed thus far--how we got to where we are now in our thinking--was already somewhat familiar to most of them. The theological side of the discussion, however, generated more interest and more heat, for the teachings of the Scriptures could not be more at odds with their mindset than in this: as followers of Jesus Christ we are called to a radical commitment based on a radical certainty. In the introduction to his gospel Luke assures Theophilus that he has taken care to present him an accurate and orderly account "... so that you may know the certainty of the things you have been taught" (Luke 1:4). Carved into the bell tower that is the most striking architectural edifice on the campus of the University of Texas are Jesus' words from John 8:32: "You will know the truth and the truth will set you free." On this basis he calls each of us to "deny himself, and take up his cross, and follow me" (Matthew 16;24). In the Scriptures "knowing the truth" and "being certain" go hand; the latter is only laudable because the former is possible. It's here that the mindset of the evangelical church, too, is often at odds with the Scriptures. For as our culture's confidence in its ability to know truth has waned, so has our willingness to present the gospel as truth and to answer the flood of questions that inevitably follow. A few years ago I spoke to a group of international students on the subject "What is Christianity?" My first goal was to dispel their misconceptions; I told them Christianity is neither just a western cultural phenomenon, nor a personal existential choice. It claims to be the Truth of the Universe, the Way Things Really Are. And I urged them to evaluate it in light of those claims. The first question that followed my talk was from a Turkish student: "Are you saying that Islam is false?" I paused before answering, "I'm saying that both Christianity and Islam may be false, but they cannot both be true, because they teach different things about who God is, who we are, and the world we live in. And, yes, I'm convinced that Christianity is the one that is true." "I believe the same thing," he replied, "but about Islam instead of Christianity. But, you know," he continued, "you're the first Christian I've met who believes this about Christianity." Perhaps this is why Senator Schumer and others like him have found it so easy to be contemptuous and mistrustful of Christian certainty. For the last two centuries we have been content to justify our certainty in the name of blind faith and to invite others to buy into it on the same terms. But when you buy your certainty on sale is it any wonder that in the eyes of the post-modern world, it has little worth? Bargain-store certainty damages the gospel in ways that are more fundamental than defacing the church's reputation. When we baptize cultural norms in the name of faith, the post-modern generation replies with "I told you so." (A few years ago while serving as an elder in an American church, I brought before them a friend and new convert who was asking for their prayers and advice regarding a custody battle he was involved in with his ex-wife over their two children. On seeing their names tattooed on his wrists, one of the elders insisted that he repent of the sin of tattoos before he would pray for him.) And even when we affirm that which is true and biblical--e.g. the sanctity of human life--but do so with arrogance and know-nothing pride, the watching world throws the baby out with the bathwater, rightly rejecting our lack of integrity and compassion, while wrongly rejecting the truth of the gospel. Recovering a sound certainty means recovering a biblically sound faith, beginning with the recognition that faith is valid only if its object is true. In confronting the idolatry of his day Isaiah ridiculed its foolishness. A man cuts down a tree. Half of it he uses for firewood, the other half he makes into an image, which he worships. The prophet takes pains to make clear that this isn't wrong because it violates religious norms; it's wrong because it's stupid. According to the Bible any faith whose object is not true is not faith at all; it is vain belief And the only true object of faith is the God of Abraham, Isaac, and Jacob. But faith, like certainty, is more than merely knowing the truth. It's what we do in response to knowing the truth. Francis Schaeffer spoke of this in a way that any Swiss peasant fond of hiking in the hills could understand. Imagine yourself climbing in the Alps, say the Dents du Midi, a trio of peaks across the valley from the Schaeffer's old home in Huémoz. The day that started so fair quickly turns foul as the fog closes in and the temperature drops. In your haste to get off the mountain before your are trapped by the weather, you leave the path, only to find yourself caught on a ledge with no clear idea of how you got there and no viable avenue of escape. Your situation seems hopeless, until a voice calls to you from across the way. The caller identifies himself as a long time resident of this area. He assures you that he knows where you are, and that just below your ledge is an unseen path that will lead you to safety. He encourages you to hang from the ledge and drop. Not too quickly, of course. First you ask questions. Who is he? Does he know people you know? Can he describe to you the parts of the mountain you know? Does he really know what he's talking about? The number of questions you ask isn't important here. What's important is that by asking them you become certain that he knows what he's talking about, that he's telling you the truth. But being convinced of this doesn't demonstrate your faith. Hanging and dropping does. 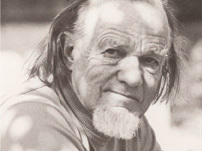 Dr. Schaeffer also made clear what the biblical equivalents of hanging and dropping are: bowing before God metaphysically, confessing that He is God and that I am not, and morally, confessing that He is holy and I am not, seeking His forgiveness through the finished work of Christ on my behalf. Anything less reduces faith to a mere mental abstraction, and nothing is less abstract and more practical than biblical faith. In the Bible the hallmark of true faith is always practical: how do we live our lives? Understanding the truth and bowing before God in faith should change us and the way we live. We're to change morally, living our lives by a different set of standards than those of the surrounding culture. Even the secular world expects to see this kind of change in those who "get religion" and, alas, all too often doesn't. But the gospel transformation called for in the Scriptures is more radical and far-reaching than this. We're to actually change the way we look at and think about the world we live in. In Romans 12:2 the apostle Paul urges us, "Do not conform to the pattern of this world, but be transformed by the renewing of your mind." Renewing your mind is not a mystical process. Here Paul is urging us to reshape our thinking in light of what we've seen to be true. We're to see the world differently because we know it to be a creation of God, not a cosmic accident. We're to see and treat people differently because we know they are made in His image. And we're to see that what we do has significance beyond the financial and the existential, because we are created to do it and our actions and choices matter. Before she became my wife, Mary Jane became a Christian at age 18 while a university student. She realized perhaps better than most the magnitude of what this entailed. Hers was not merely a religious commitment, adding a spiritual dimension to an otherwise unchanged life. It was an intellectual revolution that necessitated rebuilding the way she thought and lived. She saw this as so pressing and immediate a need that she left school, family, and Canada behind her for a time in order to find sanity and encouragement in the home of Udo and Debby Middelmann. Sound radical to you? It did to me, too, at one time. (I used to joke that I was glad I didn't know her when she was 18. I was a witless teenager, and she would've scared me to death.) But perhaps the reason why her actions seem strange to some, and why certainty is so elusive are one and the same. Modern and post-modern students alike at the University of Texas see success as a matter of technique. Theirs is the world of Dale Carnegie: winning friends and influencing people is the key to happiness. They see ideas as having little practical value, so they invest nothing in them. As a result their intellectual muscles, their ability to think things through, to restructure a worldview, and to live it out, to achieve certainty is more than a bit rusty. To them Mary Jane's story is foolishness and certainty is an impossibility. Why waste time and effort on a project-- thinking and living world-viewishly--that is pointless? With their hearts and minds atrophied from lack of use, the thought of lifting an idea, weighing it, gaining certainty from it, seems as impossible as to them as walking would be to an adult who spent his entire life in bed. In truth it is not impossible, but it is hard. Certainty, confidence in our knowledge and our faith, isn't a starting point from which we ignore the questions that confront us. It is a conclusion, or rather a series of conclusions we reach along the way. It is by wrestling with ourselves, with our world and our ideas reasonably and existentially, and by Gods' grace, that we mature in our faith, in our ability to know the truth, and in certainty. The Enron judgment is only one factor in alerting us to the public weight of failure. The market is the most efficient tool for the distribution of resources and a fine meeting place for supply and demand. But it is not moral, does not show compassion, is not divine. It has in itself no human component. Human beings create it, use it and protect it with laws. It serves us well. But ‘us’ are not free to view the market only in terms of the advantages we get as supplier or provider. Let me state my concern this way. The market, like democracy or road traffic, only functions well when the participants exercise moral restraint over their powers, i.e. when their concern is not only what they are legally and physically able to do, but also whether any of it should be done. The morality of road use is brought out by traffic laws and safety checks, which no one except for libertarians would call socialism from state interference. Democracy only works when people have more in mind than themselves and their rights. We debate, write, argue and vote for the benefit of the whole of society, not only for my interest group. I will represent my group foremost, but the outcome of the many votes attempts more than the safeguarding of my selfish interests. The majority has the obligation to protect, lead, respect and convince the minority, and at times the other way around: The minority will argue against the foolishness of the majority. For that to work we need to have a moral compass, a sense of common good in a long-term perspective. Both on the road and in the country we are in it together. Politics is a polite policing of rather selfish people. It does not promote rights, it rather protects them against those who won’t admit them. The market also requires more than an easy exchange of goods and services. It is an efficient tool for the practice of both good and evil! Participants in the market must also have a moral compass, a realistic worldview and a habit of self-restraint. It is not enough to make ignorance, foolishness or desperate needs of market partners be the only sole restraint on human selfishness, greed and opportunism. Just because I can get away with something does not make it right. Socialism enforces rules that hinder market functions. Individualism is its opposite and uses the market. Both deny, at opposite ends, the only viable, real-world reality, which I call social awareness. It has no set of enforceable rules, but is a voluntary factual and honest appraisal of human beings active in the market. We live at all times in a social context. We have family, neighbors, widows and orphans, unproductive children, all of whom will be around for years. We have not made ourselves and depend on others. We face a judgment in history as well. This is not a sanctimonious spiel. It would be folly to imagine or pretend otherwise. From the understanding of our social reality Christians should shed light on failings in the naked market. People easily overlook them, because the market does not complain, is a-moral and puts up with them. First, there is the Enron scandal. Perhaps the constant emphasis on imagination in all of life from childhood on (“live out your dream”) has encouraged a habit that now surfaces as imaginative schemes of reporting and accounting. Imagination is the starting point of all art and science, of love and commitment, but also of sin, deception and fraud. When imagination takes its flight too high and looses contact with the real world, with cause and effect, with debt and obligations, reality prove more solid and people will crash. One cannot fly to the sun with wings made of wax and feathers. Second, we must protest the scandalous discrepancy in pay scales between executives and employees. I have no mathematical rule for morality. But it does appear wrong that the ratio between top and bottom employees is so much more than the arbitrary ratio of 20 to 1 that J. P. Morgan adopted. But $145’000 for a CEO every day in salary and compensation is immoral by any standard. Pay for executives should face much stiffer opposition by the public, by investors and by different social and political traditions, which require disclosure and debate. It is particularly shortsighted when the consequences are not calculated. As he became more successful Henry Ford paid his workers more rather than less, for they were also his clients, able to buy the cars they built. The excessive sums paid at the top are better distributed among all those who contribute to the profit, with little if any economic disadvantage over all. The rich stimulate the economy more through investments, but others stimulate it through consumption and saving, leading to investment also. The total amount of money still circulates in the economy. More people can afford to buy locally produced things instead of undermining their own jobs when they can afford only cheaper foreign goods. An interdependent society will circulate money, insight and improvements by being each other’s customers. That happens also through globalization, but few realize that we compete against cultures with dismal human rights and labor protection records, which their market tolerates. It will observe all kinds of realities, including 12-hour workdays, little vacation for physical and intellectual recreation and children without a childhood. The rise of America’s corporate profits from 7% of GDP in 2001 to 12.2% now is good for equity investors, but has not been seen in a related rise in wages. Too much “imagination” is at work, and too little ‘noblesse oblige’ when pension plans get dumped while top salaries get raised. Why is the loyalty of only the top rewarded with increased pay? Why are wages decided on the basis of what the market will bear, demand or tolerate, rather than on the quality of the work performed? An employee should be paid for the importance of her work, not in relation to someone else willing to work for less. Private benevolence reduces many social problems. But “to them that have there is an obligation to distribute” by fairer wages as well, by improved public places, subsidized concerts, funding for schools. The market is a mechanism. People should be directed by their trained conscience, not by market tools. They should play a part and taken an interest in local life. The discrepancies are a cause for concern. They lead to new class distinctions, together with educational failures and growing social resentment. Crime and anger, social conflict and family tension are signs of failure in the public contract. Thirdly, Frank Schaeffer’s excellent book “AWOL” describes a growing cultural conflict between the general population and the military. Consistent with postmodern individualism the military is considered to be one more private fascination of people who like it rough, play extreme sports, shoot with guns and enjoy being mean. Absent a draft only the peculiar and other social failures volunteer for that kind of thing. It is no longer a question of protecting all, the whole country in a common stand against the faces of evil. Now TRUTH has been abandoned, truths exist separately for each person. In the military the pay ratio between the highest general and the new soldier is 11 : 1. One finds there a camaraderie without equal, a society with a common purpose. Yet it may increasingly wonder whether the defense of selfish, profit driven and irresponsible individualists, who see the military only as an association with violent interests, is worth the price they have to pay with their lives in harm’s way. There is trouble ahead unless we return to common sense and a more Christian life.